With flowers that are shaped like a stomach it is easy to see where these succulents get their name. A genus of around 15 species, Gasteria are native to South Africa, related to Aloe and Haworthia. A fairly easy care plant, they make excellent potted specimens as well as being suited to the rock garden. Many also have prominent flowers, however it is usually for the foliage that this group of succulents is grown. Most , such as G. baylissiana, are dwarf species with attractive patterned foliage. Some have been hybridised with aloe species and are named Gasteraloe. Foliage is generally tongue shaped, so common names include Ox Tongue. All are stemless succulents which leads to a neat growth habit. Some are naturally rosette forming other will grow as distichous forms, (leaves in two ranks) however as they clump this is often not evident. Foliage colour varies between species as well as within, from a mid dull green/grey to a very deep green. All have attractive lighter coloured markings. 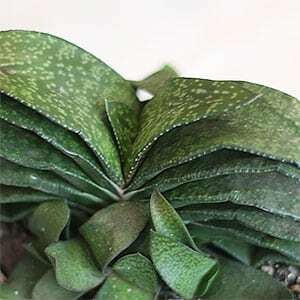 Gasteria are in general require sun to part shade they require very little maintenance. Use a succulent potting mix or other free draining soil. In the garden they grow well amongst small rocks. Only water during the growing season. Propagate from seed, or by division / separation of pups. 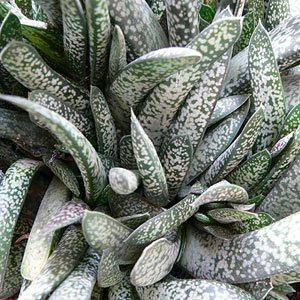 Gasteria are suitable for growing in containers or pots, especially the smaller species.